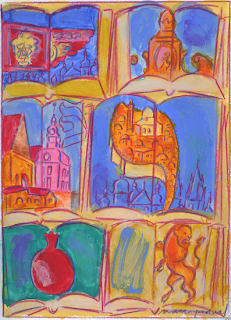 Mark Podwal will exhibit 50 works in his upcoming art exhibit, From Jerusalem to Prague, including sample embroideries of the textiles he was commissioned to design for the Altneuschul in Prague. Exhibit on view May 2 to May 26. Artist's reception Tuesday May 21 at 6 PM. Centre d’Art et de Culture - Espace Rachi. 39 rue de Broca, 75005 Paris, France. The exhibition is being organized with the Czech Centre in Paris. Mark Podwal may have been best known initially for his drawings in The New York Times. In addition, he is the author and illustrator of numerous books on Jewish legend, history and tradition. His art is represented in the collections of the Metropolitan Museum of Art, the Victoria and Albert Museum, the Israel Museum and The Jewish Museum in Prague. His 1972 drawing forThe New York Times on the Munich massacre was exhibited at the Musée des Arts Décoratifs. 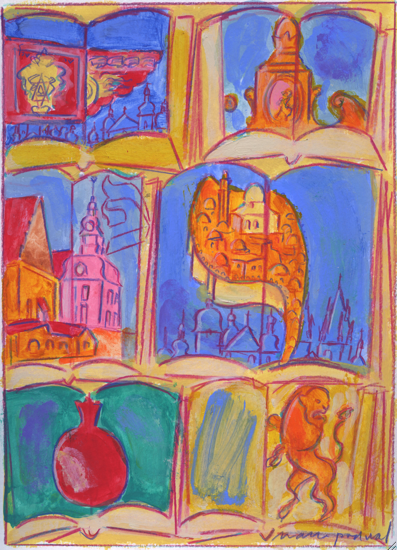 Among Podwal’s many collaborations with Elie Wiesel areL’Golem, La Haggadah de Paque, and King Solomon and His Magic Ring, which won a Silver Medal from the Society of Illustrators. In 1996, Podwal was named anOfficier de l'Ordre des Arts et des Lettres. Beyond his works on paper, Podwal's artistry has been employed in an array of diverse projects including the design of a series of decorative plates for the Metropolitan Museum of Art. His art has been engraved on the Congressional Gold Medal awarded to Elie Wiesel and has been woven into an Aubusson tapestry to adorn Temple Emanu-El, the largest synagogue in the world. In 2011, Podwal received commissions to illustrate a Passover Haggadah for the Central Conference of American Rabbis Press; to design new embroidered textiles for Prague's seven hundred year old Altneuschul; and to create The Metropolitan Opera poster for Verdi’sNabucco. Also in 2011, Podwal received the Jewish Cultural Achievement Award from the Foundation for Jewish Culture. Podwal is represented by Forum Gallery, New York.